The CE App has a full suite of features to make keeping on top of CE credits easier and more effective. Plus — it’s absolutely free! Using our easy interface, track each activity as you attend. Our extensive database allows you to simply attach a certificate and the rest of the details will fill automatically. 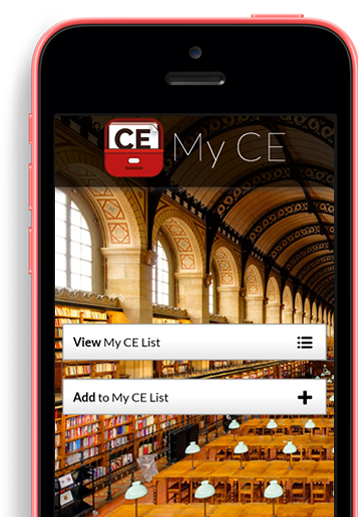 Once you’ve created a CE list on your phone, you can email that list to anyone. The list is automatically formatted for easy submission to accrediting organizations. The app was designed with usability in mind, so we ended up with a gorgeous product that’s just as easy to learn as taking notes for the first time. Licensed professionals are amongst the busiest people in the world. We continuously have conversations with different professionals to make the most useful product with industry-leading features. There’s nothing better than free, right? We decided that for the benefit of the professional community, along with our vision to help make CE more efficient and easy, it would serve everyone’s interests if it were FREE, so hop on over and get it today. WHAT ARE PROFESSIONALS SAYING ABOUT THE CE APP? Get The CE App on iTunes today. It’s absolutely free! You have been sent an invitation to use My CE.